The ability to dream is a fascinating aspect of the human mind. However, how the images and emotions that we experience so intensively when we dream form in our heads remains a mystery. Up to now it has not been possible to measure dream content. Max Planck scientists working with colleagues from the Charité hospital in Berlin have now succeeded, for the first time, in analysing the activity of the brain during dreaming. They were able to do this with the help of lucid dreamers, i.e. people who become aware of their dreaming state and are able to alter the content of their dreams. The scientists measured that the brain activity during the dreamed motion matched the one observed during a real executed movement in a state of wakefulness. 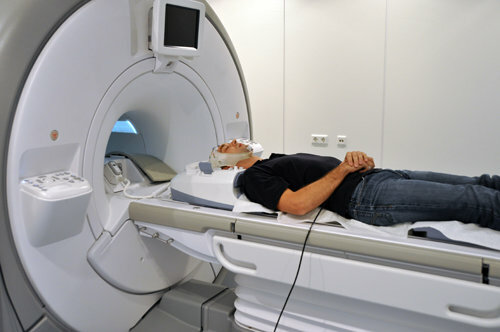 Patient in a functional magnetic resonance imaging machine. Methods like functional magnetic resonance imaging have enabled scientists to visualise and identify the precise spatial location of brain activity during sleep. However, up to now, researchers have not been able to analyse specific brain activity associated with dream content, as measured brain activity can only be traced back to a specific dream if the precise temporal coincidence of the dream content and measurement is known. Whether a person is dreaming is something that could only be reported by the individual himself. Scientists from the Max Planck Institute of Psychiatry in Munich, the Charité hospital in Berlin and the Max Planck Institute for Human Cognitive and Brain Sciences in Leipzig availed of the ability of lucid dreamers to dream consciously for their research. Lucid dreamers were asked to become aware of their dream while sleeping in a magnetic resonance scanner and to report this “lucid” state to the researchers by means of eye movements. They were then asked to voluntarily “dream” that they were repeatedly clenching first their right fist and then their left one for ten seconds. This enabled the scientists to measure the entry into REM sleep – a phase in which dreams are perceived particularly intensively – with the help of the subject’s electroencephalogram (EEG) and to detect the beginning of a lucid phase. The brain activity measured from this time onwards corresponded with the arranged “dream” involving the fist clenching. A region in the sensorimotor cortex of the brain, which is responsible for the execution of movements, was actually activated during the dream. This is directly comparable with the brain activity that arises when the hand is moved while the person is awake. Even if the lucid dreamer just imagines the hand movement while awake, the sensorimotor cortex reacts in a similar way. The coincidence of the brain activity measured during dreaming and the conscious action shows that dream content can be measured. “With this combination of sleep EEGs, imaging methods and lucid dreamers, we can measure not only simple movements during sleep but also the activity patterns in the brain during visual dream perceptions,” says Martin Dresler, a researcher at the Max Planck Institute for Psychiatry. Activity in the motor cortex during the movement of the hands while awake (left) and during a dreamed movement (right). 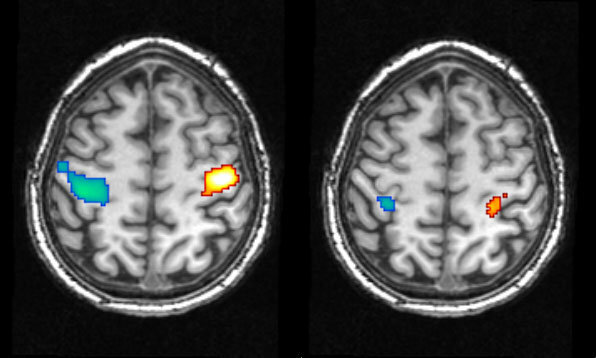 Blue areas indicate the activity during a movement of the right hand, which is clearly demonstrated in the left brain hemisphere, while red regions indicate the corresponding left-hand movements in the opposite brain hemisphere.